New for 2019, Pioneer Network is offering two unique webinar series. The Growing Person-Centeredness Webinar Series will feature 60-minute webinars designed to provide the latest information on innovative ideas that support best practices that are person-centered, or better still, person-directed! 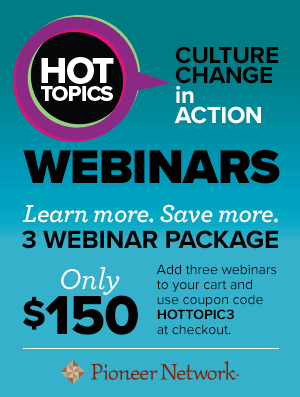 Webinars will be led by guides who are subject matter experts as well as leaders in the Culture Change movement. Webinar purchase includes live viewing plus access to the recorded webinar for 12 months. The Sharing the Vision Webinar Series will feature 30-minute interactive webinars designed to share new ideas and information that will inspire and challenge us as we work together to share the vision and change the culture of aging.